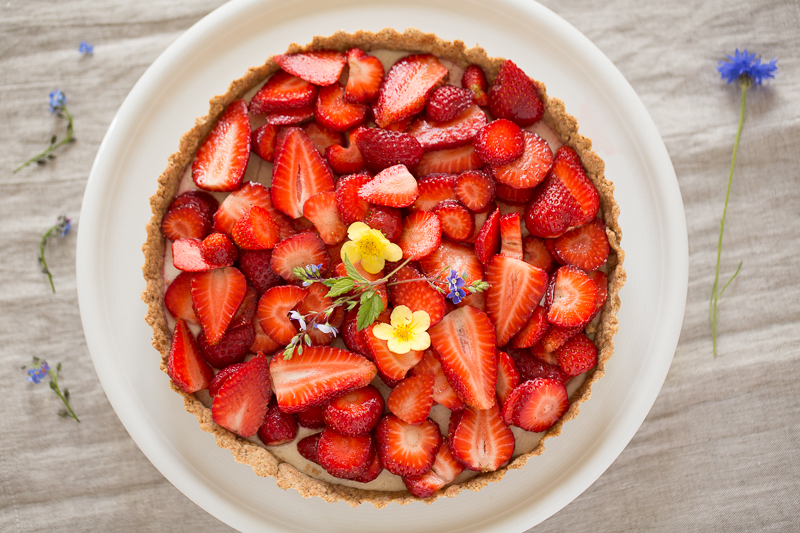 I realize that strawberry season is coming to an end but this tart is a great base for any berries or stone fruit and the vanilla custard is really great. I have been making tarts for quite some time and have been tweeking the vanilla custard each time. Since experimenting with aquafaba I thought it would make a wonderful addition to the custard and I wasn’t wrong. It gives the custard more lightness which is similar to a traditional custard. If you are unfamiliar with aquafaba, it is the water from cooked chickpeas or other legumes. I have only experimented with chickpeas, so I can’t say if it works with other bean water. I imagine white beans would also be a good substitute. Other bean water would disturb the colour. If you would like to explore more aquafaba recipes please visit the wonderful Facebook group: Aquafaba/Vegan Meringue:Hits and Misses. Lightly oil a 24 cm tart pan with removable bottom. Set aside. If you are using whole almonds, toast the almonds in the oven for 10 minutes and allow to cool off completely. Grind them in a food processor for no more then 10 seconds. Stir the ground almonds with the remaining dry ingredients in a large bowl. In a separate bowl whisk the oil, maple syrup and vanilla until completely combined. Add to the dry ingredients and mix with a spatula until everything is moistened. If still dry, add a little oil. Using plastic wrap press the dough into the tart from working from the centre to the sides. The bottom should be a little thicker then the sides. Place in the fridge to cool as you wait for the oven to hat up. Bake the crust for 15 to 20 minutes or until the sides are lightly browned and the bottom looks dry. Set aside to cool. Release from the form after it has cooled off completely and either place in the fridge or leave on the counter as you prepare the vanilla custard. For the custard strain the cashew and rinse and then place in a high speed blender with the coconut-rice milk. Blend it for 2 minutes until completely smooth. In a sauce pan warm up the cashew mixture along with the agar powder, aquafaba,maple syrup, salt and vanilla and dilute the arrowroot with 2 tablespoons of water in a separate bowl. When the mixture comes to a boil, add the arrowroot mixture and bring back to a boil and then take off the stove immediately. The mixture should thicken by now but to make sure place a teaspoon in a small dish in the freezer for 5 minutes and test the texture. If it has hardened than you have the right consistency. If not you can wait for the mixture to cool off and add another 1/2 teaspoon of agar powder and bring to a boil again. Transfer the cashew cream into a container and let cool off for 5 minutes before pouring it into the tart form. Put the tart in the fridge to cool for at least 4 hours or overnight. 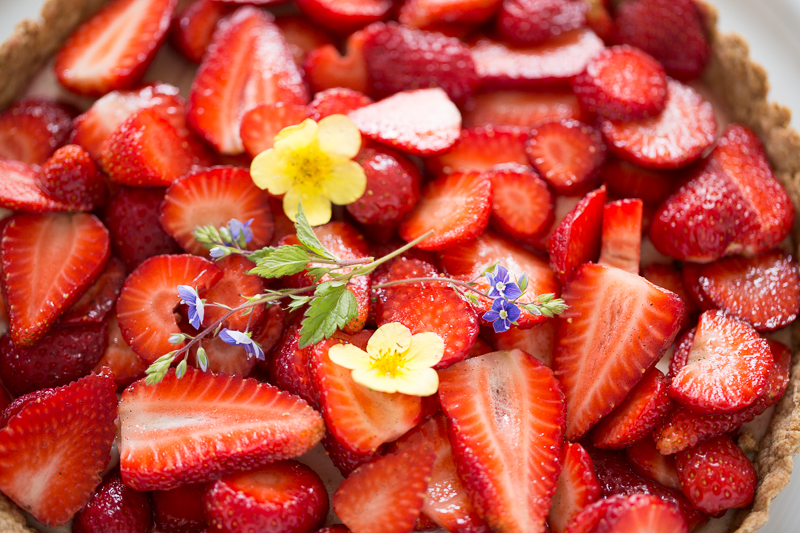 About 1 hour before serving wash and cut the strawberries into a bowl and mix with a little coconut sugar, vanilla (if desired) and rose water and mix gently. 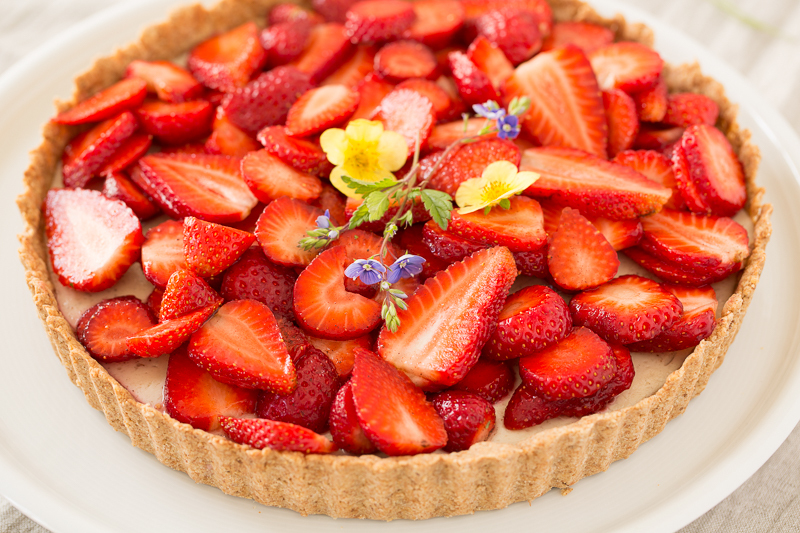 Place in the fridge for an hour to macerate and then top the cooled tart with the strawberries and serve.